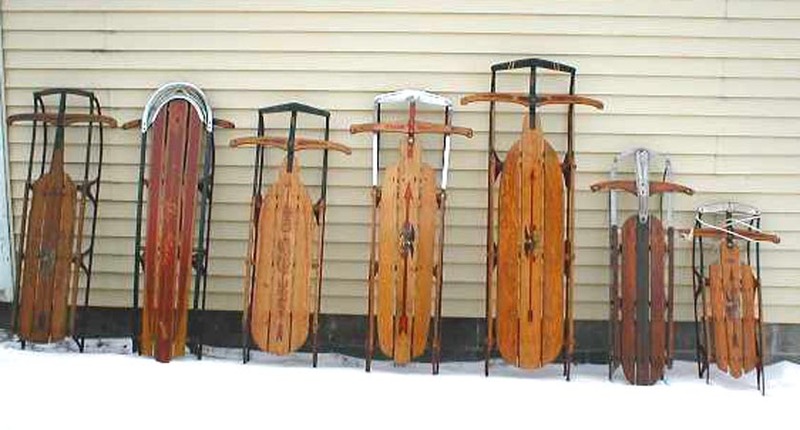 Coming to this page will be a collection of sleds from Art Bransky. He has around 300 sleds and is a noted authority on sled cleaning and identification. He can be reached at: Arthur Bransky jr. This is just a small sample of what will come. 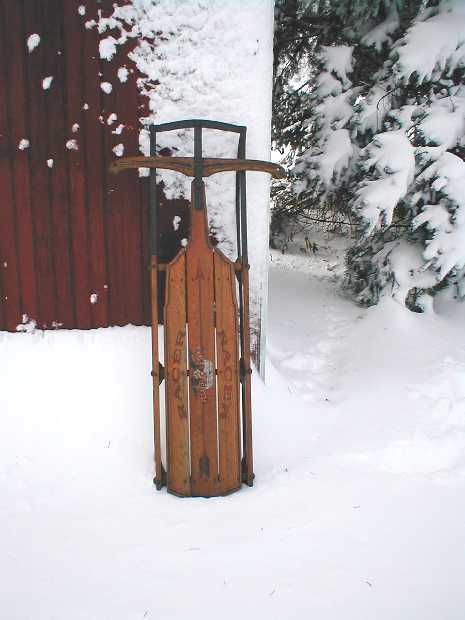 A collectors tip from Art: When you get a snow cover in your area, that is the time to snap some sled shots. Your snow/sled photos can be used to make your own Holiday greeting cards. Besides you are placing the sled in it's natural habitat. 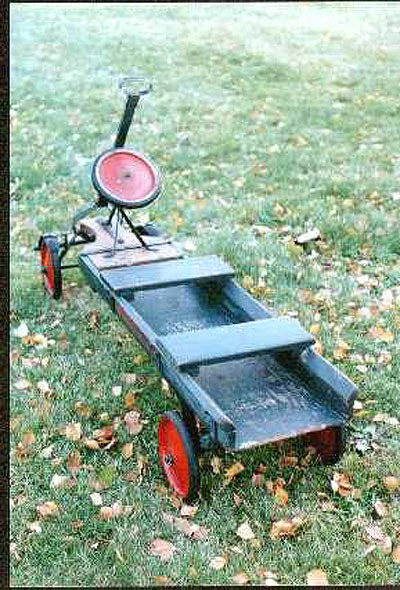 Keen Wagon/Sled - It is the only one I have seen in 15 yrs. of collecting. It is a wagon/bob sled combination. The only markings are the decals which read "Keen Coaster". The wagon converts to a bob sled by removing the wheels and installing the bobs. It has a home made look about it but was factory made. It is all original. 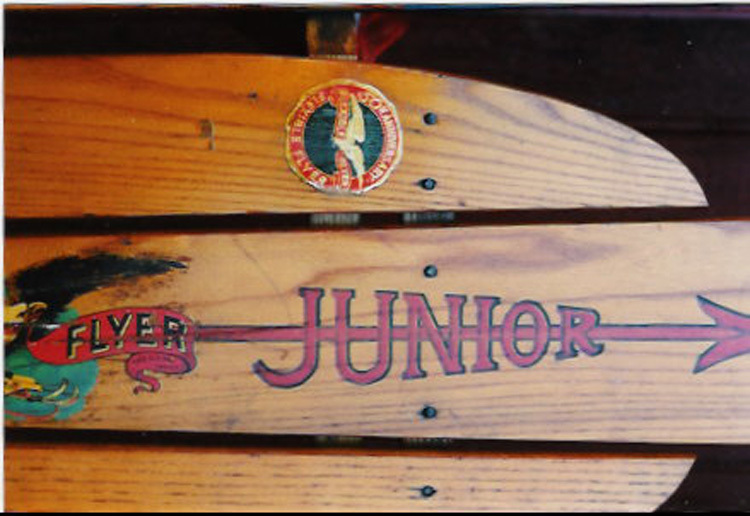 FF - Airline Junior - 1939 Flexible Flyer, the usual sled with one important exception. This sled still has the original paper label shown below. This marks the sled as the 50th anniversary model. The label is printed and foil embossed. It reads: 50th Anniversary - Flexible Flyer. Art writes that this is a truly rare find and is the only time he has seen one with the label, and that the first time or two of use would destroy the label for sure.